"Both these things are in the wrong time. But what are they doing here in 1917?" 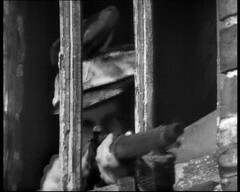 One of the firing squad is hot by a sniper allowing Zoe to rescue the Doctor. Smythe reports he is leaving for the conference to his superiors as a Tardis noise is heard and a black box materialises. Ransom bursts in but Smythe convince him he's seen nothing and has been called to a meeting then enters the box and dematerialises. Jamie meets a Redcoat solider in the cells who thinks it's 1745. He remembers fighting in the highlands, then there being a mist and then being in the First World War. 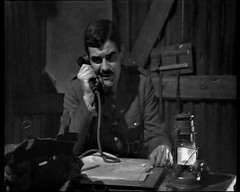 The Doctor pose as an Examiner from the War Office with Zoe as his secretary. Ransom, Carstairs and Buckingham search for the escaped prisoners. Jennifer is starting to doubt what happened during the court-martial and is remembering a mist, which Carstairs blames on gas. Jamie and the Redcoat stage an escape but the Redcoat is killed, Jamie is recaptured and taken to the Examiner. Zoe knocks the commandant of the prison out and they make to leave but are cornered by Ransom. Jennifer is still doubtful of the trial when Ransom returns with his prisoners. Carstairs makes known his objections to the court martial, but Ransom still believes it was fair. Jamie tells the others about the Redcoat and Zoe about the communications device. The Doctor wonders what they are doing in that time period where they don't belong. Carstairs talks with the prisoners and takes them to the General's room to see the screen for himself. The Doctor finds the screen but neither Jennifer or Carstairs can see the screen till the Doctor gets them to concentrate. In a control room elsewhere Smythe watches them. 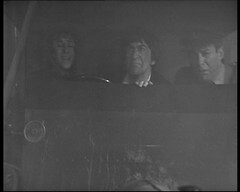 The Doctor and his friends escape with Jennifer & Carstairs in the ambulance. 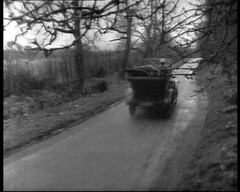 Smythe returns and orders the ambulance found and shelled, convincing Ransom over his objections of attacking an ambulance containing women. The ambulance drives into mist which obscures their view. Jennifer is overcome by an urge not to go on. When the mist clears they find themselves on a peaceful dirt track near a river. Climbing a hill to get a better view they find a Roman Legion charging towards them! DOCTOR: Stop! And about time too! Where have you been? DOCTOR: You were sent to meet us! DOCTOR: Now don't argue! Take us to the prison! In you get, Miss Heriot. Well, drive on! Then he gains entry to the prison as an Examiner from the War Office , a little nod towards his first story Power of the Daleks where he also poses as an Examiner perhaps? GORTON: Who? Civilians? Well, tell them to wait. I'm having my tea. DOCTOR: How dare you treat me like this, sir! GORTON: What? Who the blazes are you? DOCTOR: Don't you address me like that, sir! This is disgraceful! I shall make a complaint directly to the Minister himself! GORTON: Minister? Oh, I don't understand. Who are you? DOCTOR: I'm the examiner from the War Office, I'm here to inspect the military prison. This young lady is my secretary. Well, you were expecting us, surely? GORTON: Well, there must be some mistake. I mean, can I see your identification papers? DOCTOR: How dare you! You send no car to meet us on our arrival, and now you add insult to injury by doubting my credentials! Do you know who I am, sir? GORTON: Well, I'm terribly sorry and all that. It's probably my adjutant's fault. Would you care for some tea? DOCTOR: We are here to inspect the security arrangements of the prison. Now I suggest we stop wasting time and get on with it! All this is done just using the force of his personality, no sign of any of the "psychic paper" the new series is fond of using to get round any identity issues. Wonderful stuff. REDCOAT: Highlander! Keep away from me, you! JAMIE: Hey, easy now. I'm a prisoner too, you know! How'd you get here? Well, come on, how did you get here? REDCOAT: I don't know, I can't remember! I got lost, I think. JAMIE: What year do you think it is? REDCOAT: Year? Why, it's seventeen forty five. Then you get the deepening mystery of what is actually going on. The presence of the Redcoat makes it obvious something's not right with time here and is a nice reminder of Jamie's origins in the Jacobite rebellion too. JAMIE: Look, you must try and remember! REDCOAT: I've told you. I was fighting up in the Highlands, I got lost and I don't..... There was this mist. REDCOAT: It came down all round me. The next thing I knew, everything was different. JAMIE: Well, how do you mean, different? REDCOAT: Well, there were these great big guns, bigger than I'd ever seen before, and carts moving along without horses. JAMIE: Aye, I've seen those too. Now, go on, go on. 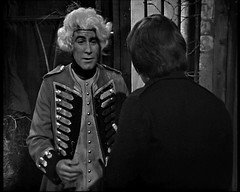 REDCOAT: Well, then these fellows in the funny uniforms, they came along, and they caught me and brought me here. Where are we? JAMIE: I don't know. But I've got to get to the Doctor. Look, and you're going to help me. REDCOAT: Oh, no! I don't trust you. You're one of them rebels! JAMIE: Now look, just you listen to me a moment. BUCKINGHAM: You remember we were talking about not remembering things? BUCKINGHAM: Well, things are starting to come back to me. CARSTAIRS: What sort of things? BUCKINGHAM: Well, I was on my way to the hospital, well behind the lines. I was driving through a forest and all of a sudden there was a strange sort of mist. Fog. And then I was in a field dressing station looking after some wounded soldiers. CARSTAIRS: Hmm. Loss of memory. BUCKINGHAM: No, but isn't it strange that you should to be suffering from it too? CARSTAIRS: I wonder, could it be some kind of new gas? If perhaps the Germans have invented a new type of poison gas, one that affects our minds. The Doctor meanwhile is concerned things aren't as they should be. JAMIE: Aye, and he thinks he's in 1745. DOCTOR: But that's a complete anachronism. JAMIE: Aye. It's a what? DOCTOR: It's something out of it's own time. ZOE: Yes, like the telecommunications unit in the General's room that I told you about. ZOE: I found it when I was looking for the key. DOCTOR: Both these things are in the wrong time. But what are they doing here in 1917? By the end of the episode we know that there are at least three different conflicts connected to each other here, seemingly by the areas of mist that the Doctor & friend drive through: the First World War, the Highland conflict of 1745 and something involving Romans. But how is it possible to move between the three different times? A decent mystery is slowly evolving here. More location work this episode. We briefly saw Birling Manor Farm providing the building exteriors at the end of the first episode but we get much better views of it here. 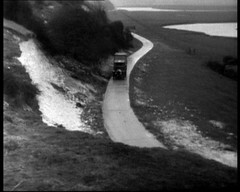 The Lane, West Dean provides the slope The Doctor & Zoe observe the prison from and the road where the Doctor talks his was into the car driven by the military chauffeur played by Peter Stanton. 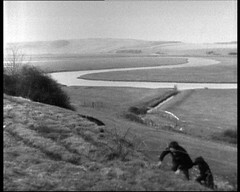 The sequences in the Roman Time Zone are filmed at Seven Sisters Country Park. More new cast this episode. Richard Steele is Gorton, the prison commandant, and he'll be back as Sergeant Hart in Doctor Who and the Silurians, and a Guard in The Mark of the Rani. He'd been the television Quatermass and the Pit as a Sightseer in Hob. 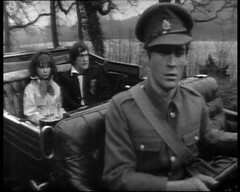 The redcoat is Tony McEwan who's also Baldwin in Planet of Evil, also directed by David Maloney. He's not the only member of this story's cast to return for that story either! 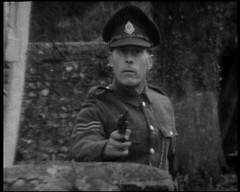 In a blink and you'll miss him appearance as one of the Military Policemen who opens fire on Jamie & the redcoat is the king of the background characters, Pat Gorman in a credited roll! He was last seen in The Invasion as a Cyberman and will next return in The Silurians as a Silurian. 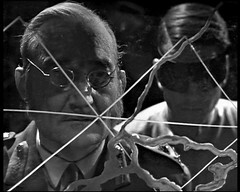 Previously he was a Freedom Fighter/Rebel in Dalek Invasion of Earth, a Planetarian in Mission to the Unknown: Delegate Detective thinks he's Sentreal the black Christmas tree, a Greek Soldier in The Myth Makers, a Guard in Massacre, a Worker in The War Machines, a Monk in The Abominable Snowmen, a Guard in The Enemy of the World, a Cyberman in The Invasion and a Technician in The Seeds of Death. He returns as the Silurian Scientist in The Silurians, a Technician in The Ambassadors of Death, a Primord in Inferno, the Auton Leader in Terror of the Autons, a Primitive & Long in Colony in Space, a Coven Member in The Dæmons, a Guard & Film Cameraman in Day of the Daleks, a Sea Devil in The Sea Devils, a UNIT Soldier in The Three Doctors, a Presidential Guard and Sea Devil in in Frontier in Space, a Global Chemicals Guard / 'Nuthatch' Resident in The Green Death, a UNIT Corporal in Invasion of the Dinosaurs, a Guard in The Monster of Peladon, a Soldier in Planet of the Spiders, the Gate Guard in Robot part one, a Thal Soldier in Genesis of the Daleks, a Cyberman/Dead Crewman in Revenge of the Cybermen, a Guard in The Seeds of Doom, a Soldier/Brother in The Masque of Mandragora, a Chancellery Guard in The Deadly Assassin, a Medic in The Invisible Enemy, a Kro in The Ribos Operation, the Pilot in The Armageddon Factor, a Thug in City of Death part one, a Gundan in Warriors' Gate, a Foster in The Keeper of Traken, Grogan in Enlightenment, a Soldier in The Caves of Androzani, a Slave Worker and a Cyberman in Attack of the Cybermen. Of those it' easiest to spot his face in Abominable Snowmen, Planet of the Spiders, Robot and The Armageddon Factor! He's got several Blake's 7 appearances to his name as a Scavenger in Deliverance, Federation Trooper / Rebel in Voice from the Past, Trantinian planet hopper Captain in Gambit, Death Squad Trooper in Powerplay, Federation Trooper in The Harvest of Kyros & Rumours of Death, Hommik Warrior in Power, Helot in Traitor and a Federation Trooper in Games & Blake. We was also in Adam Adamant Lives! as a Guard in More Deadly Than the Sword, a Man at Club in Beauty Is an Ugly Word, a Coven Member in The Village of Evil, a War Office Guard / TA Soldier in D for Destruction and an S.S. Guard in A Sinister Sort of Service. He appears once in The Prisoner as a Hospital Orderly in Hammer Into Anvil and just once in Doomwatch as Man in Hear No Evil. His Porridge appearance in the second Christmas Special The Desperate Hours is another easy spot: he's the Prison Officer who comes into the loos as Fletcher and friends are sampling the contraband home brew. 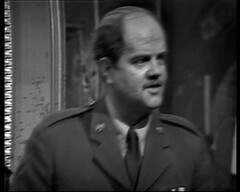 He was in two episodes of The Sweeney as a Flying Squad Officer in Thou Shalt Not Kill (director: D Camfield) & Latin Lady, and two The Tomorrow People stories: Worlds Away as the Vesh Hunter and War of the Empires as a US Marine. 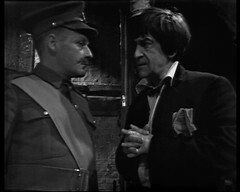 In the BBC The Day of the Triffids he played a Blind Man in episode 5 while in Douglas Camfield & Robert Holmes adaption of The Nightmare Man he played The Killer with Camfield using him again as a Legionnaire in Beau Geste. He was in The Professionals five times: as a Golfer in Killer with a Long Arm, a CI5 Agent in Close Quarters & Servant of Two Masters, a Security Man in Weekend in the Country and the Police Superintendent at inquest in Discovered in a Graveyard. He's a Policeman again in The Young Ones: Interesting and towards the end of his career Russell T Davies uses him in Dark Season as a Heavy. The Sniper that fires on the shooting squad is Clive Rogers. IMDB thinks he was a Space Guard in The Space Pirates and returns as a Resistance Man in episode five of this story before playing a Brother in The Masque of Mandragora and a Mentiad in The Pirate Planet. He's also in Doomwatch as a Visitor in The Iron Doctor. IMDB has James Haswell down as a Prisoner in this episode. I've not spotted any so I'm a little suspicious about this credit. He was a Guard in Bell of Doom, an extra in Seeds of Death 4's location filming, supposeldy an Extra in The Space Pirates, and returns as Corporal Champion in The Ambassadors of Deathand a Beat Policeman in The Talons of Weng-Chiang whioch is also directed by David Maloney. He'd also appear in the missing Out of the Unknown The Yellow Pill (director M Fergusson)as a Plainclothes Man and the Blake's 7 episodes The Harvest of Kairos as a Labourer and Children of Auron as an Auron Technician. Another Prisoner, so again we're slightly suspicious, is Douglas Roe who's in Blake's 7 as a Federation Trooper in Seek-Locate-Destroy & Blake. Bill Hughes is down on IMDB as a Prison Guard / Prisoner. He'll be back in The Talons of Weng-Chiang as well as a Passer By while Paul Phillips, with the same role against his name, is also a miner in The Monster of Peladon. Onto the Roman Soldiers: Raymond Farrell Roman Soldier was a Tavern Customer in The Massacre and an Inferno Customer in The War Machines. He'll be back as a Guerilla in Day of the Daleks episode three & American Aide in Day of the Daleks episode four followed by a Prison Guard in Frontier in Space. 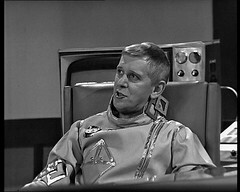 He's also in Moonbase 3 as a Technician in Outsiders. We saw Tom Laird earlier this season in The Seeds of Death Episode Four as the prone Doctor when Troughton last took a holiday. Crawford Lyall appears in three Doomwatch episodes as a man in Burial at Sea, Invasion & The Logicians. "We're back in history, Jamie. One of the most terrible times on the planet Earth!" 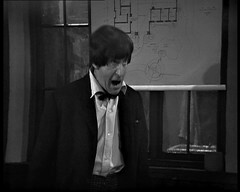 Welcome to the fiftieth Doctor Who story which is also the last and longest second Doctor story. JAMIE: The thing is, where are we? ZOE: Early twentieth century isn't it, Doctor? DOCTOR: Yes. I'm afraid that we've landed up in the middle of one of the worst wars in human history. JAMIE: What are they dug into the ground like this for? DOCTOR: Well, it's trench warfare, you see, Jamie. These trenches stretch right the way across the continent of Europe. JAMIE: Well, what are they fighting for? DOCTOR: Well, I well I believe that they call it The War to End Wars. World War One is an easy location to do and as with most things involving a setting prior to the present day the BBC does it very well. 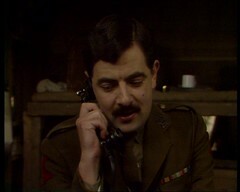 Unfortunately anything World War One now makes you think Blackadder Goes Forth as Liz, who saw the start of this story with me, pointed out as they reached the trenches. That view was confirmed the moment that Major Barrington appeared on the screen because he looks not dissimilar to Rowan Atkinson! 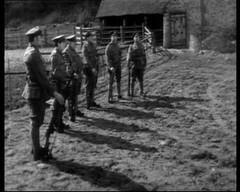 It's not helped by the Doctor being arrested, thrown into prison and facing a firing squad bearing a distinct resemblance to the Blackadder episode Corporal Punishment! BARRINGTON: Right, sir. We'll go over the top at oh four hundred hours. Sir. As you say, sir. Well, that was General Smythe. Big push tomorrow. How long have you been out here? CARSTAIRS: Well, sir, it's odd, but I can't quite remember. BARRINGTON: I know. It seems like forever, doesn't it? It's the holes in the World War One scenario that are the really interesting parts to the episode and the main one is several people seem to be having problems with their memory. CARSTAIRS: Where is your hospital? BUCKINGHAM: Oh, it's not far. BUCKINGHAM: Well, you're going to think me awfully silly, but I can't quite remember. CARSTAIRS: Don't worry, it'll come back to you. Memory's a funny thing out here. Can't always remember things myself. BUCKINGHAM: What kinds of things? CARSTAIRS: Oh, silly things. Names, dates, how long I've been here. Sometimes wonder if I've got a touch of the old shell shock. Have you talked to anybody else about it? BUCKINGHAM: Haven't liked to. One feels so stupid. CARSTAIRS: Yes. Still, it is rather worrying not being able to remember things. BURNS: I'll see that they bring you something to eat. DOCTOR: Oh, thank you. Sergeant Major? Have you been at the front long? BURNS: Can't remember. Here, what are you asking me all these questions for? Then there's the distinctly non WWI communication device in Smythe's room. Who's he talking to? How's he persuading people that what he says is right? He seems to put his glasses on to do it. The closest to this episode I can think of is The Time Meddler, which similarly has a historical setting with a few out of place elements, where we're asking what's the Monk doing with a wrist watch & binoculars. Wipes the floor with any episode of the Space Pirates this does! You know the Space Pirates finished off the Lost In Time DVD set, Doctor Who's first 3 disc DVD? The War Games is the second 3 disc set. Right, one last round of musical chairs for this season! Peter Bryant has been taken ill so former script editor Derrick Sherwin, who'd been shadowing him, steps up into the breach. 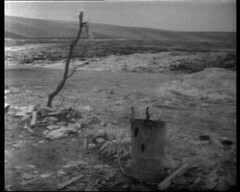 As we'll see later, two stories had fallen through at the end of the season so script editor Terrance Dicks and his mentor Malcolm Hulke, one of the writers on The Faceless Ones, drew the short straw of having to craft a ten part serial to replace a four parter and a six parter. 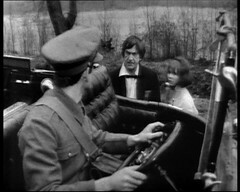 Since the later of those stories was scheduled to be Troughton's last appearance, that had to be worked in as well. As Dicks was co-writing this serial no script editor is credited for it even though he held that post. Back for the third time this season comes director David Maloney following The Mind Robber and The Krotons. Having directed no episodes before this season he would, by the end of the story be in fifth place with 19 behind Christopher Barry, with 20, Richard Martin & Derek Martinus with 22 and Douglas Camfield with 35. All bar Martin will add to their totals. The film recordings of the episodes that make up this story was originally sourced from two locations: Episodes 2, 5, 8 & 9 were present in the BBC Film & Video Library in 1978 when Ian Levine first visited. 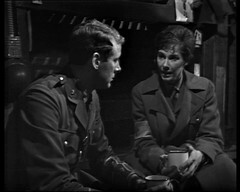 All ten episodes were found as negatives at the BFI, who returned them to the BBC. 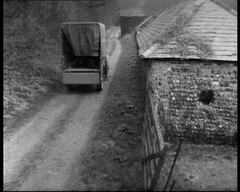 It was believed that the BFI returned their original negatives but when the BBC's copies were later damaged, leading to the odd patterns seen on certain episodes during the video release, and enquiries made of the BFI it was discovered that the BFI had returned copies of their negatives. New superior prints were then struck from the BFI's negatives giving a superb quality of picture used for the basis of the DVD release. All the location filing for this story was conducted in Sussex around the Eastbourne area. 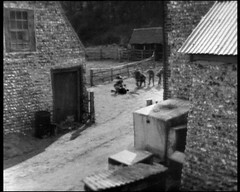 Sheepcoat Rubbish tip, recently home to the film production Oh What A Lovely War, forms the majority of the First World War locations. Doctor Who: The War Games DVD has a Now & Then film showing the locations as they appear in the story and as they do now. There's also some excellent contemporary photos of the location in the DVD's photo gallery. We need to look at the cast for the earlier episodes of this story, and due to the length of this story we'll need to keep coming back as more cast members show up. Lt Carstairs is played by David Savile who'll be back as Winser in The Claws of Axos, and Colonel Charles Crichton in The Five Doctors. Of all the guest cast he's in the most episodes of this story appearing in the first nine. 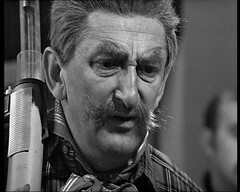 Before Doctor Who he's had some experience with science fiction appearing in the first season Out of the Unknown episode The Counterfeit Man as Gerry. 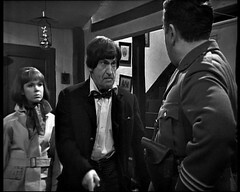 This episode survives and can be seen as part of the Out of the Unknown DVD Set. 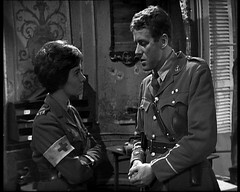 He also appeared in the film version of Quatermass and the Pit as an Army Officer and plays a hospital doctor in the UFO episode The Man Who Came Back. 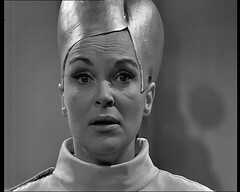 Lady Jennifer Buckingham is the one Doctor Who appearance for Jane Sherwin, the wife of producer Derrick Sherwin. She later appears in the Blake's 7 episode Pressure Point as Kasabi. 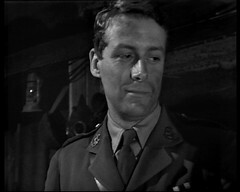 Hubert Rees, who we've already seen as the Chief Engineer in Fury from the Deep, plays Captain Ransom here, and returns as John Stevenson in Douglas Camfield directed The Seeds of Doom. He's another Camfield favourite appearing in many of the director's non Doctor Who productions such as The Sweeney episode Thou Shalt Not Kill where he plays Reginald Dowland. He's also in Sweeney 2, the second film based on the television series, as a Bank Manager. 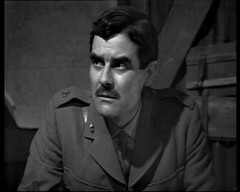 Noel Coleman plays the very suspicious General Smythe. Many, many years later he plays the Cat Priest in the fourth Red Dwarf episode Waiting for God. Playing Sgt. 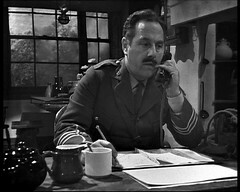 Major Burns is Esmond Webb. He disappears after this episode and then pops up again in the 7th when Smythe also returns! 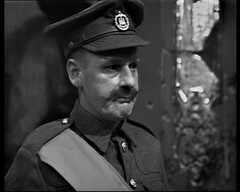 The aforementioned Blackadder lookalike Major Barrington is played by Terence Bayler. It's not his first Doctor Who appearance as he previously played Yendom in The Ark episode 3 The Return. 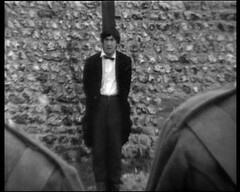 Later in his long career he goes onto have an association with the Monty Python's Flying Circus team which begins with appearing in a variety of roles in Rutland Weekend Television which led to playing The Rutles manager Leggy Mountbatten in All You Need Is Cash and appearing as Gregory in Monty Python's Life of Brian. Apparently he ad-libbed the famous "I'm Brian and so is my wife!" line. Terry Gilliam uses him again in Time Bandits & Brazil. One of his most recent film appearances was as the The Bloody Baron Ghost in Harry Potter and the Philosopher's Stone. Toby Hadoke interviews him in Who's Round 074. He died on the 2nd August 2016. We now enter the murky world of The War Games' extras. As a ten part story, which features location filming, several of the extras show up in more than one role. 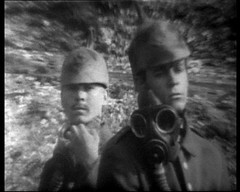 For example David Billa, who's down on IMDB as a German Soldier for this episode is also down as a German / Roman Soldiers / Alien Technician for episode 4 and a Time Lord Technician for episode 10.I suspect that's him on the left of the photo bellow as the other soldier speaks so is the credited German soldier John Livesey. 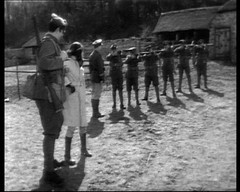 The firing squad contains a large number of extras who have worked on the series at different points. Keith Ashley was an Extra in The Savages and returns as a Technician in Doctor Who and the Silurians, a Villager in The Dæmons, an Extra in Planet of the Spiders, a Dalek Operator in Genesis of the Daleks, a Zygon in Terror of the Zygons, Sir Colin's Aide in The Seeds of Doom & a Brother in The Masque of Mandragora. 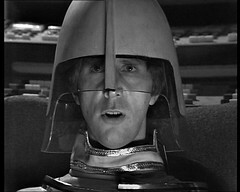 Roy Brent returns as a Miner in The Monster of Peladon and appears as an Armoured Knight in the Monty Python's Flying Circus episode Njorl's Saga. Eden Fox is also a miner in The Monster of Peladon: Imdb reckon he's in episode 2 of this story as a machine gunner. Alex Hood returns as a British Soldier in episode 7, and is another technician in The Silurians. He also plays a man in the second series Doomwatch episode The Islanders. Finally from the Firing Squad is Tom O'Leary who IMDB think is a Prison Sergeant in episode 2 plus German / Roman Soldiers / Austro-Hungarian Officer in episode 4. I don't think he can be playing THREE roles there but we'll have a go at seeing if we can see an actor reused! He's also an Auton in Terror of the Autons, another Miner in The Monster of Peladon and Albert Einstein in Time and the Rani! IMDB has Derek Hunt down as Carstairs' and a British Soldier in episode 7. He returns as a U.N.I.T. 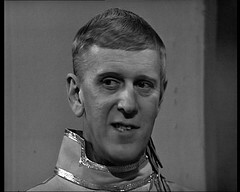 Soldier in Day of the Daleks, a Prison Guard in Frontier in Space, James the footman in Black Orchid and a Man in Market/Dinner Guest in Snakedance. Another Carstairs' Man, presumably the soldiers on location which help recapture the ambulance, is David Melbourne. He's plays a Resistance Man in episode 4 but is also a British Soldier in episode 7 which makes me wonder if there's a pair of British soldiers also shot on location there. Something to watch out for. He later returns as a U.N.I.T. 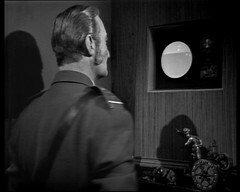 Guard in Day of the Daleks. He also appears in Moonbase 3 as a technician in Castor and Pollux & View of a Dead Planet, another Technician in the Blake's 7 episode Dawn of the Gods and a Hotel Guest in the Fawlty Towers episode Communication Problems. Ken Fraser, who's down as a Sentry here, was previously a Guard in The Enemy of the World. Alastair Meldrum is listed on IMDB as a Trench Solider / Chateau Guard for this episode. They reckon he's another British Soldier in episode 7 and a Resistance Man in episode 9. He's also got 3 uncredited Doomwatch episodes on his CV: a Bar Customer in Tomorrow, the Rat, a Man in Re-Entry Forbidden and a Man in Train and De-Train. "I think your friends intend to save me a lot of trouble. Once they get that old crate up into space, I can cut in the remote control any time I like. Stop their oxygen and deliver a cargo of dead pirates to General Hermack!" Jamie & Zoe escape their guards and find the Doctor. Milo Clancy and Dom Issigri are trapped on Clancy's ship which is out of their control and a diminishing oxygen supply. Caven has Dervish booby trap the Issigri base by setting demolition charges in the atomic fuel store before they leave. 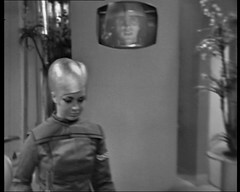 The Doctor reactivates the Oxygen supply on Clancy's ship and instructs Clancy in how to disconnect the remote control. Reaching a safe distance the pirates send the signal to detonate the explosives but the Doctor has successfully removed the detonator preventing an explosion. Major Warne in a Minnow tracks the pirates Beta Dart and destroys it. Madeline is taken to Earth to stand trial in her part in proceedings while Milo Clancy offers to take the Doctor, Jamie & Zoe to Lobos to retrieve the orbiting space station fragment containing the Tardis. So the Tardis crew finally spend a whole episode interacting with the rest of the cast.... and because of the requirements of location filming for the War Games the regulars all the scenes involving The Doctor, Jamie and Zoe had to be pre filmed. I hold my head in my hands and weep. If they had to be off somewhere else filming for the next story why not schedule it for an episode, like virtually any of the others but especially 1 or 2, where they have minimal interaction with the rest of the cast and are hardly in it? Madness. 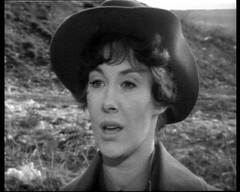 I've gone away and thought about this: the only member of the cast that the Tardis crew interact with in this episode is Madeline Issigri. Clancy and Dom Issigri are in Clancy's spaceship, the pirates are escaping and Warne & Hermack are pursuing them. The scene at the end could have been accomplished with the Tardis crew on one side of the room and the rest on the other... In fact the Tardis crew never meet Warne & Hermack during the story which is odd given what large roles they play in it. But at least at the end there's a little tension with the countdown to the explosives going off. I will not be remembering the Space Pirates with fondness for anything in the program itself. We start Doctor Who's final missing episode on Wokingham station finally sat on the South West Train that will take me to Richmond. The Space Pirates was the last Troughton story - bar the two Dalek stories - to be novelised by Target books. It was also the last Doctor Who novelization by Terrance Dicks.... and in two stories time I'll tell you about his first! A soundtrack CD with narrations by Fraser Hines was issued in 2003. "No! I will not be party to murder. When all this started it was going to be a salvage operation. Space flotsam, you said. But then piracy and now murder?" The Doctor, his friends and Clancy are flung into an old fashioned study by Caven. Inside they find Dom Issigri, Madeline's Father who Caven has been holding prisoner. Caven sabotages Clancy's ship and fits it with a remote control device. Madeline Issigri, finding that Caven intends to kill the prisoners, calls General Hermack for help with dealing with the pirates, but Caven coerces her into keeping quiet when he reveals he has her Father. 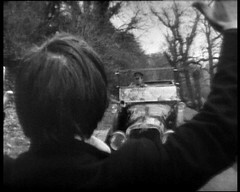 The Doctor, Clancy & Dom Issigri and Jamie & Zoe escape, but the Doctor is separated from his friends and is caught in the blast as Clancy takes off. Following on from last episode's revelations that Madeleine Issigri is working with the pirates we discover this episode that the long thought dead Don Issigri is actually still alive! MILO: Well, I thought Madeleine blamed me for her father's death. Poor old Dom. He just disappeared. Years ago now. I wasn't even here at the time. And then all this piracy started and Madeleine started to find argonite in workings that Dom and I had abandoned years ago. Well, it all seemed to fit together somehow. So has he been kept prisoner in his study on Ta, right under Madeleine's nose all this time? Dom Issigri's daughter Madeleine was in episode two so we know what she looks like. She's played by actress Lisa Daniely, who was one of the stars of the 1959 Invisible Man that Esmond Knight appeared in playing Diane Wilson. The same production also features former Doctor Who companion Deborah Watling as her daughter Sally Wilson! Lisa Daniely also appeared in the now missing first season Out of the Unknown episode Andover and the Android as Eleanor. Playing Madeleine's secretary is Valerie Stanton who was previously in The Massacre: Priest of Death as a Parisian in Rue des Fosses St. Germain. IMDB has Ron Conrad as an Extra for this episode only. He'll be back as A German / Roman Soldier / Alien Student in The War Games and a Soldier in The Ambassadors of Death episode 3. Right, I'm now at Reading boarding a rail replacement bus. Ah the joys of bank holiday rail travel. Nowadays I avoid Rail Replacement Buses as you don't know what will be provided. Quite frequently it's a coach and the steep steps are beyond me now! Yes the entries for this story have been brief. I'm struggling to find things to say about it, it just doesn't work. "Oh, come on now. If I was in cahoots with the pirates, why would I be trying to rescue you?" 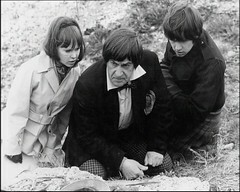 The Tardis crew find the injured Lt Sorba, seized from station Alpha 4. General Hermack retrieves Major Warne and they pursue a Beta Dart used by the pirates. The Doctor opens the audio lock on the door of the cell they fell into. They find Clancy and escape to Madeline Issigri's office telling her of the pirates on Ta but when Caven enters killing Sorba they realise she's in league with them. Finally an episode that's a bit more like what it should be. Yes they're in a cell for much of the episode but they're trying to escape and then do something when they do get out. JAMIE: Oh, look, Doctor, will you stop it? ZOE: What's that noise? It's getting on everybody's nerves. DOCTOR: You want to get out of here, don't you? JAMIE: Oh, that's not going to get us out. DOCTOR: Yes, Jamie, it is! An audio lock is a simple solenoid switch which is only activated by a particular sound. It's just a question of finding it, that's all. JAMIE: Oh look, I can't stand any more! DOCTOR: Jamie, you found the right note! That's a rehash from Power of the Daleks where the Doctor attempts to escape his cell, which also has an audio lock. He uses a glass of water to generate the note there! HERMACK: Switch video through here. We might as well all enjoy this. Oh if only we could! I've recognised another actor in the series! 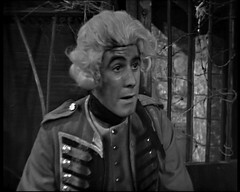 Jack May, playing General Hermack was a noted voice actor who I recalled as being the voice of voice of Igor in Count Duckula when I last blogged this story. Since then I've looked at his substantial IMDB entry! He was in the acclaimed An Age of Kings BBC production of William Shakespeare plays and, like many of the cast, performed multiple roles over the plays. 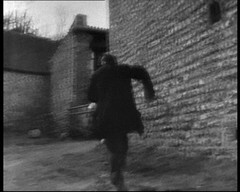 He then appeared in A for Andromeda as Major Quadring in The Miracle & The Last Mystery followed by the Out of the Unknown episode Stranger in the Family where he played Evans. This first season episode exists and can be seen on the Out of the Unknown DVD Set. He has a recurring role in Adam Adamant Lives! as the butler William E. Simms and appears in the UFO episode Confetti Check A-O.K. as the English Delegate. 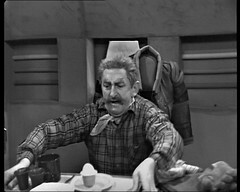 I really should have remembered his performance as Garkbit, the head waiter at the Restaurant At The End Of The Universe in the TV Version of The Hitchhiker's Guide to the Galaxy! Jack May, playing General Hermack, Theoden What I did recall is that he appeared in one of my favourite radio series: He's Theoden in the acclaimed Radio 4 adaptation of The Lord of the Rings which also features Donald Gee, Major Ian Warne, as Radagast the Brown. 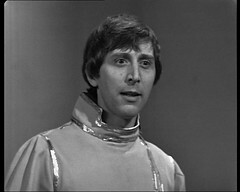 Other Doctor Who personnel involved include Gerard Murphy (Richard in Silver Nemesis) as the Narrator, Bill Nighy (the guide in Vincent & The Doctor) as Sam, David Collings (Mawdryn in Mawdryn Undead) as Legolas, Peter Howell (The Investigator in the Mutants) as Saruman, Philip Voss (Acomat in Marco Polo & Wahed in The Dominators) as the Lord of the Nazgûl, Michael Spice (the voice of Morbius in The Brain of Morbius and Magnus Greel in The Talons of Weng-Chiang) as A Nazgûl/Háma and Stephen Thorne (Azal in the Daemons, Omega in the Three Doctors and an Eldred in Hand of Fear) as Treebeard. It's fab, buy the CDs. It's been 3 weeks since we last heard of Lieutenant Sorba, who was left behind with a crew of guards on station Alpha 4 and presumed dead. I'd forgotten about him and not realised it was the same character who I heard briefly in in episode 1! He's played by Nick Zaran, but is one of two major character in this story we have no visual record of. If you want to see what the actor looks like to give you a clue then he's got some pictures on aveleyman.com. IMDB reckons that Bill Richards is a Pirate in this episode. He'd been a sailor in Flight Through Eternity, the third episode of The Chase and a Monoid in The Ark and would return as a Union Soldier in The War Games. He's also down as appearing in episode 1, which is a possibility but I'm always suspicious of episode 1 imdb supporting artist credits as extras for the entire story tend to be logged against the first episode. I'm also suspicious of the presence of James Haswell & Derek Chafer who IMDB both list as extras. Jimmy Haswell. If he's in this episode then it's his third appearance in having been a Guard in The Massacre and a similar role in the location sequences in Seeds of Death 4. IMDB think he's in 4 stories out of 6 now he also returns as a Prisoner in The War Games and Corporal Champion in The Ambassadors of Death before taking another absence followed by playing a Beat Policeman in The Talons of Weng-Chiang. He'd also appear in the missing Out of the Unknown The Yellow Pill as a Plainclothes Man and the Blake's 7 episodes The Harvest of Kairos as a Labourer and Children of Auron as an Auron Technician. 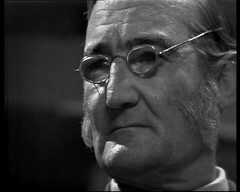 Derek Chafer has a large Doctor Who CV. He's worked for Douglas Camfield on Doctor Who playing a Saxon in The Time Meddler, which was his first appearance on the show. He returns as a Greek Soldier in The Myth Makers, a Guard in The Masscre, a Lynch Mob Member in The Gunfighters, a Cyberman in The Moonbase episode 3 & Invasion 7 and, like Jimmy Haswell, a guard in the location sequences in Seeds of Death 4. It's the Seeds of Death roles for both of these which make me suspicious as to their appearance here as neither Chafer or Haswell have an IMDB credit for that episode and do here so I'm thinking that someone confused the stories when making the IMDB entries. He returns a UNIT Soldier in Doctor Who and the Silurians episode, a Prisoner in The Mind of Evil, a Guard in The Curse of Peladon, an Exxilon in Death to the Daleks, a Guard in The Monster of Peladon and and the Armourer in The Masque of Mandragora. The year after this episode was shown Chafer would appear in the missing third season Out of the Unknown episode 1+1=1.5 as a Man and has three Doomwatch appearances as Men in Project Sahara, Re-Entry Forbidden and The Red Sky all of which can be seen on The Doomwatch DVD. However we're on more solid ground with Steve Peters, who was also in the Seeds of Death 4 location sequences as the Ice Warrior, and is playing Pirate Guard here. He's got a speaking line somewhere so gets a credit and I can see his name right the way back in the Doctor Who Program Guide! He'd previously been an extra in The Romans and the leader Roboman in Daleks - Invasion Earth: 2150 A.D. as well as an Ice Warrior in Seeds of Death and would return as both astronaut Lefee and his alien substitute in The Ambassadors of Death. He was in two now missing third season Out of the Unknown episodes appearing as a man in 1+1=1.5 and a Plainclothes Man in The Yellow Pill, both of which are also directed by Michael Ferguson, who helmed Seeds of Death and Ambassadors of Death! He can be found in the Doomwatch episodes You Killed Toby Wren as a Man in Laboratory and The Inquest as a Man and appears as a Technician in the Moonbase 3 episodes Departure and Arrival & Behemoth. "That's what this whole spaceship's made of, tillium. Lasted me a lifetime round the galaxy. Makes a lousy cup of tea!" Clancy has just stunned Jamie: he rescues them from the station segment, deploying copper needles which immobilise Major Warne's ship. Zoe works out where the space pirates went: The planet Ta where Clancy wishes to hide under the nose of Madeline Issigri. Pirate leader Craven orders his subordinate Dervish to route the space station segments to Lobos, where Clancy's headquarters is located, to throw suspicion on him. Once on Ta The Doctor, Jamie & Zoe leave the ship but are chased by pirate guards and end up falling down a chasm. Oooooh Clancy is annoying! It's a somewhat eccentric performance from Gordon Gostelow with an awfully annoying accent! He's heavily featured in this episode which, combined with the rather rough quality of the audio recordings, makes it a job to follow what's going on. Thankfully I've found the scripts online! Gostelow is not an actor I'm familiar with but, like Jack May who plays General Hermack, he appears in the acclaimed An Age of Kings BBC production of William Shakespeare plays. Not a lot of the credited cast of this story have prior/future Who form. 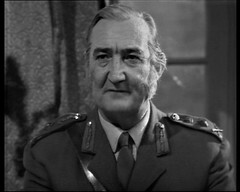 Donald Gee playing Major Warne in this Troughton's penultimate story later returns as Eckersley in The Monster of Peladon which is Pertwee's penultimate story. One if the most recognisable faces here is obscured by a moustache the owner doesn't usually wear! 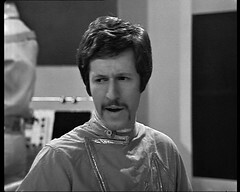 George Layton (2nd March 1943) plays Technician Penn. Famed for his role as medical student Paul Collier in Doctor in the House he's got an extensive TV CV both writing and performing. He memorably appears as Australian Ray Stackpole in Golden Fleece & Trojan Bus, two episodes of The Sweeney. Now we're back on audio we can pick up the story of how Phil listened to these episodes for the first version of this blog which was published daily.